Paramount and CBS will drop their lawsuit against Alec Peters, maker of the Axanar fan films, J.J. Abrams told an interviewer during an event promoting Star Trek: Beyond. A Paramount spokesperson confirmed the news in an email to Buzzfeed’s Adam Vary. While we’re grateful to receive the public support of JJ Abrams and Justin Lin, as the lawsuit remains pending, we want to make sure we go through all the proper steps to make sure all matters are settled with CBS and Paramount. Our goal from the beginning of this legal matter has been to address the concerns of the plaintiffs in a way that still allows us to tell the story of AXANAR and meets the expectations of the over 10,000 fans who financially supported our project…. Set in the Star Trek universe, the first Axanar film was made in 2014 aided by over $100,000 in Kickstarter funding. A prequel called Prelude To Axanar had raised over $600,000 on Kickstarter. In 2015, Paramount and CBS filed a copyright infringement lawsuit seeking $150,000 in damages against Peters. Alec Peters as Axanar’s Garth of Izar . This entry was posted in Like Show Business and tagged Axanar, Star Trek by Mike Glyer. Bookmark the permalink. Good this is being settled. Fan film guidelines should be interesting. Heck, I’m almost old enough to remember when they put it on him — on TV, anyway. I *do* remember when they put it on him. But we probably got the series later in the UK …. Note: dropping lawsuit in favor of “settlement”, plus he mention of “fan film guidelines”. Paramount/CBS “won” this round as future events will now be behind closed doors, and “he with the biggest megaphone (usually) wins”. 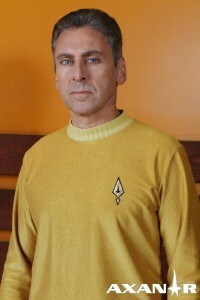 Their goals were probably: shut down the vast PR machine that Axanar had become in favor of new TV show/new film/50th anniversary (note the announcement follows “Beyond” trailer releases – numbers must have been good), scare the crap out of all fan productions, as “Prelude to Settlement”; define clear lines that will prevent any fan production from “interfering” with this year’s releases, get those to go down given what just happened with Axanar…. Correction, they were seeking $150,000 per infringement. Potentially it could have run into the millions. There is speculation that they may define new rules in the settlement that could have major effects on Star Trek fan films going on. Realistically, fan films have been pushing the boundaries for a while and Axanar did it in a lot of ways, surely getting it special attention. -An Axanar anthology supposedly with well known authors. -A coffee table book with the Axanar ships. -Their own studio (originally the Ares studio, now going to “new investors” and called the Valkyrie studio). Apparently paid for with donations raised for Prelude to Axanar and Axanar. -An ongoing workshop on how to do Science Fiction shows. There’s more but those are some of the highlights. Even after the lawsuit he said things that hurt his case. He deemed pretty much anyone that questioned him to be a “hater” and it seems that over the years he has had a tendency to getting himself banned from discussion boards because of his attitude. So all in all, not a real shock that between the money, scope, and comments by Peters this case got attention. I just hope it doesn’t hurt Star Trek fan films too badly going forward. Does this mean that Peters will start calling it a Star Trek film again after all the shenanigans to suggest it was never a Star Trek film in the first place? Or will part of the settlement be that he has to file all the serial numbers off?